Danny Rowe believes lady luck is finally smiling on AFC Fylde going into tonight’s home clash with Gateshead. Rowe opened the scoring at Leyton Orient on Saturday with a bullet of a free-kick and sealed the points when he let fly with an unstoppable 30-yard strike. 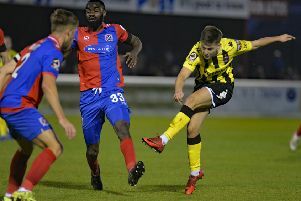 Some questioned his ability to continue his phenomenal goalscoring record at the next level but Rowe has proved his doubters wrong and now has six for the season. Only Orient’s Macauley Bonne and Dagenham hitman Corey Whitely have more National League goals than Rowe and the Fylde man believes both the club’s and his own fortunes are turning. “It’s a great feeling,” he said. “We defended really well and that was the big thing for us. They put a lot of pressure on towards the end and their goal seemed almost inevitable but we managed to hold on. “I was delighted to score a couple of goals. It hasn’t quite been going for me – I’ve hit the post and goalkeepers have been making good saves – but they went in on Saturday. “I’ve scored plenty of goals for the club and the second goal probably ranks right up there with the best. “This is the highest level we have played at, so that added to it for me. It is by far my best goal in this league, so it was a really good feeling. “To win games you do need a bit of luck and we got the rub of the green on Saturday for the first time in a while. In other games, teams have been creating very little but have still managed to score goals. That could start tonight as Fylde are five spots behind 14th-placed Gateshead but only two points separate them.